Your students really like to solve problems using puzzles. 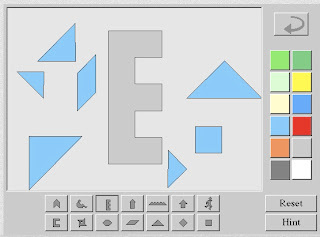 This « virtual tangram » program will certainly be useful. It includes the seven traditional pieces, that is five triangles of three different sizes, one square and one parallelogram. The objective of this Chinese game is to completely cover a model without overlapping any pieces. The program includes fourteen models and works with Macromedia Flash. If the student finds it too difficult, he or she may also ask for a hint. If you would like to know more about the history of this traditional Chinese puzzle, you can also check out this article in wikipedia. I just found out, after posting this resource, that for some models, it is impossible to properly rotate certain shapes. I will write to the University of Utah (who provides this tool) to let them know about the bug. May 9, 2007 at 6:54 a.m.